One never ending project was this raspberry blanket (project started 2012!!...) Now finished!!! 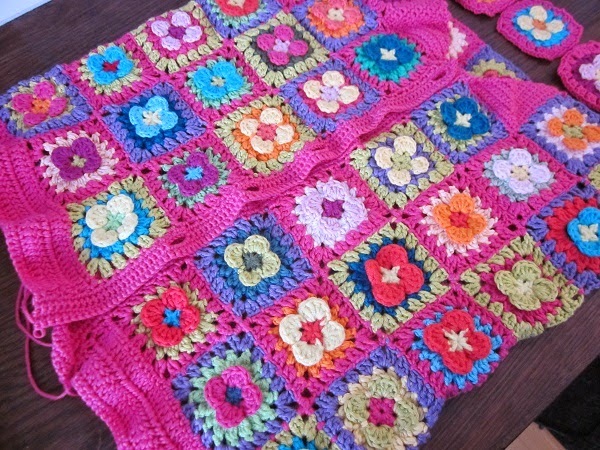 The block pattern is from a book by Melody Griffiths, 201 Crochet Motifs, Blocks, Projects and Ideas. I luuuv this book! Sorry my coment is of topic..but i can not find how i can contact u otherwise...i am Julia and i Love the Name Lilope...i want my Baby Name it..but i can not find anything to this..do u know what it actually means? Would be Great!! Hi Julia, unfortunately I don't know the meaning for the name Lilope. In my blog LiLoPe comes from the first two letters of my first name and last name (Li from Lise, Lo from Lotte...etc.) I'm very sorry! !